It’s there. I think this comparison makes it pretty clear. Fairly subtle, right? 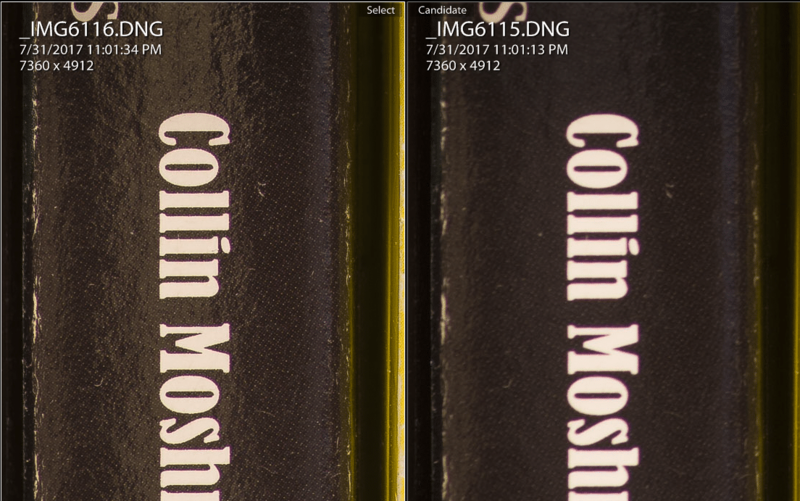 Looking at the full screen photo I noticed quite a bit more reflectivity from the spines of the books in the pixel shifted photo, but nothing major. That 1:1 shot shows a huge improvement in detail. This is a 2.5 second exposure at f5, camera bolted to the tripod, IR release used for each capture. I shot the frame on the right, pressed the button I designated to toggle pixel shift, then shot the second frame. Pretty drastic, right? Click on the image to view it at full size to see this better – the compression here makes it a bit blurry if you don’t. This entry was posted in Photography and tagged K1, Pentax, Pixel Shift, Resolution by Derek Zeanah. Bookmark the permalink.